I’ve been slowly getting back to cooking. The markets are teaming with wonderful, fresh fruits. Berries have been calling my name. 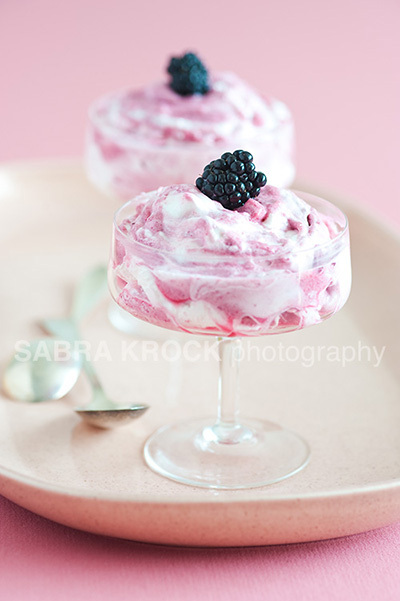 I've had my eye on a recipe for a blackberry ripple mousse from Michel Roux’s Eggs. When I saw fresh blackberries, raspberries and black raspberries in the Union Square farmer’s market I decided it was finally time to try the recipe. The recipe takes a bit of time as you first need to make a crème pâtissière (pastry cream) and both the crème pâtissière and the berry coulis need to be cool before the dessert is assembled. The assembled dessert then rests in the refrigerator for 2-3 hours before served. None of the components is difficult to make, however, and the result is delightful. The recipe calls for blackberries but you can certainly use any berries you like – just adjust the sugar according to the sweetness of the berries. Combine egg yolks and one-third of the sugar in a bowl and whisk to a light ribbon consistency. Whisk in the flour. Heat the milk and remaining sugar along with the vanilla bean in a pan. Once it comes to boil, pour it into the egg yolk mixture, stirring constantly. Mix well and then return the mixture to the pan. Bring mixture to a boil over medium heat, whisking constantly. Allow mixture to bubble, still stirring, for 2 minutes. Remove the vanilla bean. Pour onto a half sheet pan and cover with foil (touching the crème pâtissière to prevent a skin from forming). Cool in the refrigerator. Put the berries in a pan with ½ cup sugar and heat gently, stirring occasionally. When the mixture comes to a simmer, cook gently for another 10 minutes and then puree in a food processor or blender. Strain through a fine-holed sieve or a colander lined with cheesecloth. Let coulis cool, stirring occasionally. Add lemon juice. Whip cream to a ribbon consistency, then fold into the cooled crème pâtissière. Whisk the egg whites in a clean bowl to a thick foam, then add the remaining sugar and whisk to soft peaks. Gently fold in the pastry cream mixture, without overworking. Very delicately, mix in the cold berry coulis to create a ripple effect (note: you will likely need only a portion of the coulis.). Divide the mouse between 6 glass dishes and refrigerate for 2 to 3 hours before serving. Ideally serve the same day the mousse is made – the mousse does not hold up well. Just beautiful. The mousse looks so light and fluffy. You certainly would be keen to enjoy the lot without hestitation. Berries are the best. So jealous of what you can buy in season right now! Nice to see your getting back into the swing of things Sabra. I hope you and Max are doing fine! The recipe looks delicious and fresh. Just perfect for summer! What a yummie & lovely dessert!!! Sounds & looks like a delicious summer time treat. looks very light but judging from the ingregients, esp the yolks bit, it must be a heavy, fulfilling dessert. good to see you are getting back in the swing of things. I meant to go to the Union Sq market last time I was in the city, but didn't make it. Maybe next time when I go in a couple of weekend. Glad to see you back and posting. Looks Lovely. how does it compare to trifle? Yummy!!! Your blog is gorgeous! I love the overall color scheme. The dish looks delicious and when you want to eat what's on the photograph, you know it's a great photograph. Such a pretty dessert! Your presentation is very nice.